Thousands of streaming documentary, archival, how-to, and performance videos from Ken Burns, Rick Steves' Europe, National Geographic, HBO, and more- with a citation tool for bibliographies. Topics include automotive technology, career planning, and others. For technical support, please contact 1-800-322-8755 or visit Access Video's support pageopens a new window with live chat help. For technical support, please contact librarysupport@tutor.com or visit Tutor.com’s help center located at the bottom of each page in the Tutor.com FAQ section. 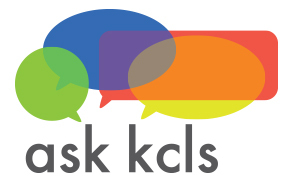 Tutor.com cannot help you retrieve your PIN If you forgot your PIN you must contact a KCLS library or Ask KCLS for help. Job leads, job search workshops, retraining, self-employment help, and direct access to employers for job seekers.